With the government planning to tell future pensioners how long they are likely to live so they can better plan their finances this new research might be useful. Research at University College London, and published in the BMJ, found that people in their early 50s who scored poorly on three simple tests of strength and co-ordination were nearly four times as likely to die in the next decade as those who did well. You can do two of these tests at home. The chair rise test is: see how quickly you can get up and down from a chair 10 times. 16.5 seconds puts you in top fifth and 26.5 seconds in the bottom fifth. The balance test is to see how long you can stand on one leg with your eyes closed. More than 10 seconds puts you in top fifth and less than 2 seconds in bottom fifth. The research was carried out using a cohort of people born in 1946 who had had their health monitored all their lives. They were tested at age 53. In the following 13 years there were 177 deaths in the group (of around 2,800), half from cancer and a quarter to coronary heart disease (CHD). Those who had performed poorly on the tests were more likely to have died regardless of other factors such as wealth or exercise. The few who couldn’t do any of the tests were 12 times more likely to have died than all those who performed the tasks. Those in the bottom 20% of scores on these tests were almost 4 times more likely to have died than the others. Fitness levels drop off from age 45 on average but there are wide variations. Separate research, also published in the BMJ, found that walking or taking similar light exercise for an hour a day could stave off the onset of osteoarthritis. In the UK the NHS has been accused of ageism in its reluctance to offer surgery to older patients. Now scientists at Seoul University in South Korea have developed a test to predict whether or not a patient will survive an operation to stop doctors using age alone to decide whether they can cope with treatment. They found that patients with a high frailty score were more likely to die within a year of having an operation. They assessed patients over 65 on their ability to walk, dress, wash and carry out other tasks as well as their performance on memory tests, their nutrition and the number of drugs they were taking. In the following year 9% of these patients died, 10% experienced complications, and 9% had to go into a nursing home. These were all patients who had scored highest on the frailty assessment. The researchers found that post-operative one-year all-cause mortality rate, length of hospital stay, and discharge to a nursing facility, could all be predicted from their assessments. Finally back to the grip test referred to above. Researchers at the International Institute for Applied Systems in Austria have found that the strength of a handshake is a good way to assess how fast people are ageing. 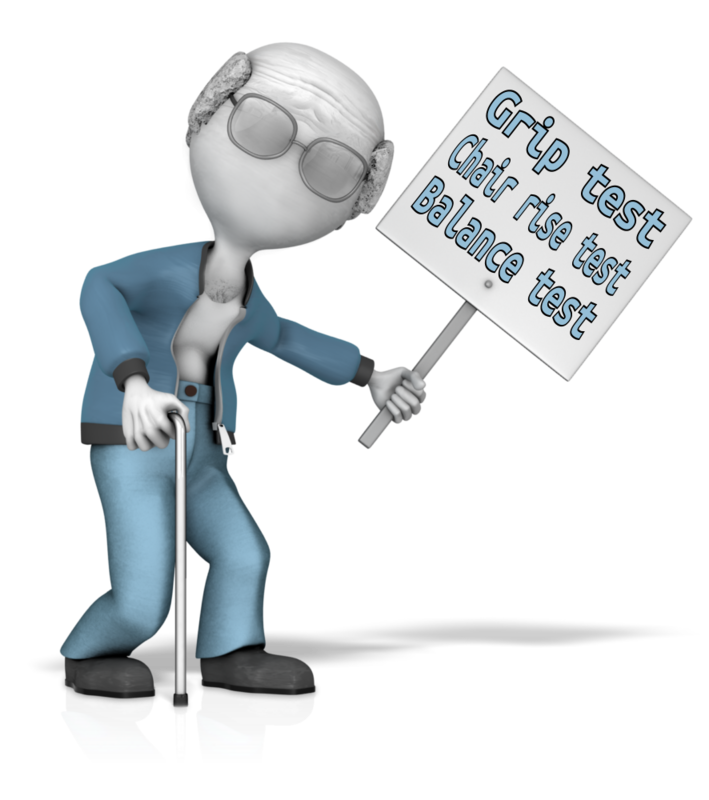 Using grip strength as a marker of biological age people who did poorly at school age about 4 years faster than those who did well. Reviewing 5o studies on grip strength they found that weakness in the hands is linked to high levels of disease and early death. If you’re younger and relying on the body mass index (BMI) remember it’s no longer considered reliable.